Notes on this item: Event programme for “Writers Putting a Full Stop to Torture,” an event in support of Freedom from Torture, 20 November 2014. Stapled programme. 21 x 14.8 cm. Julian Barnes headlined the event with a reading, but authors also auctioned various, unique items, such as being named in a future work by an author. Featured in the photos are the entries for Julian Barnes and Ian McEwan. Notes on this item: Promotional flyer promoting “Writers Putting a Full Stop to Torture,” an event in support of Freedom from Torture, 20 November 2014. 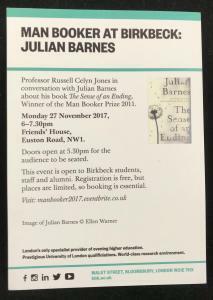 Julian Barnes headlined the event with a reading. 21 x 14.8 cm. Notes on this item: On 12 December 2015, Julian Barnes and Angela Hewitt hosted an event at the barbican called An Evening of Words and Music with Julian Barnes, Angela Hewitt and Friends in aid of Freedom from Torture. The evening featured a mixture of music and readings, as shown in this programme from the event. 21 x 14.7 cm. 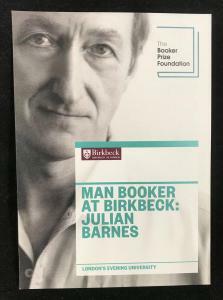 Notes on this item: Promotional card for an event titled, “Man Booker at Birkbeck: Julian Barnes”. 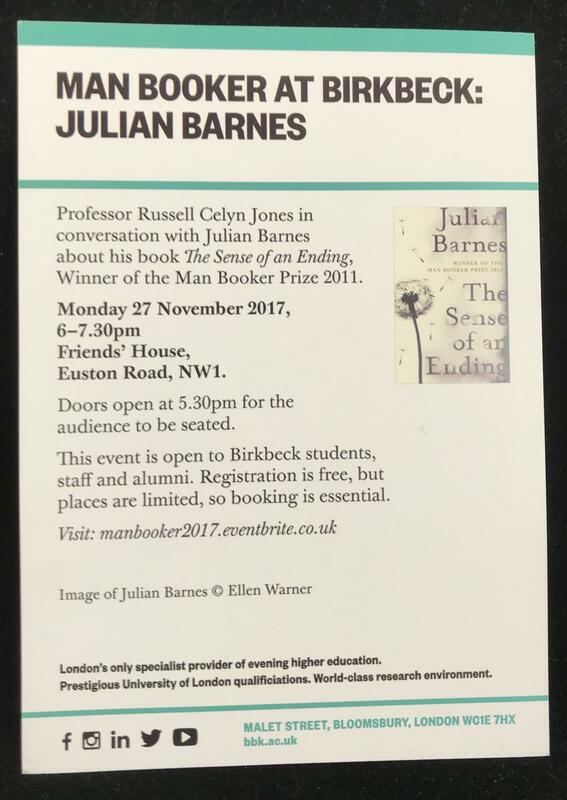 The event took place on Monday, 27 November 2017 at Birkbeck University of London, and featured Julian Barnes in conversation with Professor Russell Celyn Jones. Sponsored by the Man Booker Prize Foundation.